Once upon a time, years ago, we had a good friend over for dinner. It was the first time we’d ever hosted her so I wanted to roll out the red carpet, so to speak, with a delicious, hearty pasta carbonara. I’d never made it before, but it was pasta – how hard could it be? And then I got to the last step where I was to add the sauce made of cheese, heavy cream and eggs. And serve. Ummm…did this recipe get cut off? It wants me to serve this tossed in raw egg? I’m not gonna do that! That’s not safe! Not to mention disgusting! I’ve gotta serve something right now. Aaaahh…what do I do??! I was so freaked out over the thought of serving our guest raw eggs that I abandoned the sauce altogether. In a minor panic, I tossed the noodles with bacon, onions and a ridiculous amount of olive oil…and served it. What I did not know at the time – and I will now share with you in case you didn’t already know – is that the heat from the just-boiled noodles actually cooks the eggs in the sauce. They don’t just stay raw. 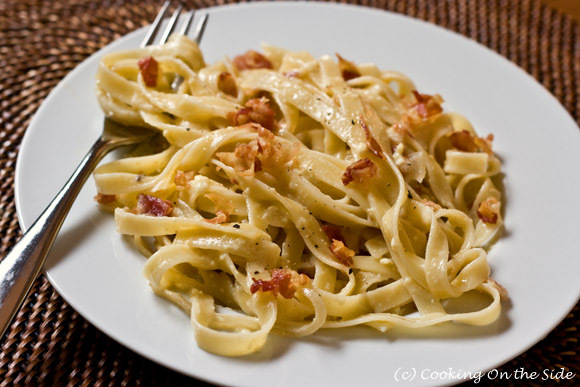 It’s such a fabulously creamy and savory sauce and is the perfect complement for the salty pancetta. Such a travesty we couldn’t have enjoyed it that first time but I’ve definitely redeemed myself since. In a large skillet over medium heat, cook pancetta, stirring often, until fairly crisp. Drain on paper towels. Cook onion in drippings in skillet, stirring frequently over medium-high heat until beginning to soften, 7 minutes. Add mushrooms and wine; cook, stirring occasionally, for 5 minutes. Bring a large pot of salted water to a boil. In a bowl, whisk eggs and cream. Stir in cheese, pepper flakes, salt and black pepper to taste. Cook pasta in boiling water until tender. Drain, reserving 1/2 cup pasta water. Return pasta to cooking pot. Immediately add egg mixture, onion mixture, pancetta and 1/2 cup pasta water. Toss well. Serve immediately. This looks SO delicious! 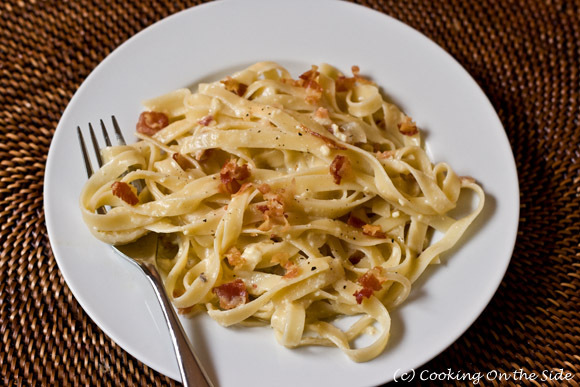 I’ve only had carbonara once at a restaurant, but I’ve never made it myself. I must admit that the egg part always freaked me out. I need to share one of my favorite “on the side” recipes with you at some point. It’s a brownie recipe that uses maraschino cherries, cream cheese, and a brownie mix. It is DELICIOUS! .-= Jennifer´s last blog ..The Kitchen Notebook: Oatmeal Chocolate Chip Muffins =-. No problem-I need to find it and then I will email it to you! :) Thanks for all the great recipes! .-= dani´s last blog ..#70) Dirty Bottoms =-.